There seem to be finally some respite for residents from traffic woes at Porur intersection. 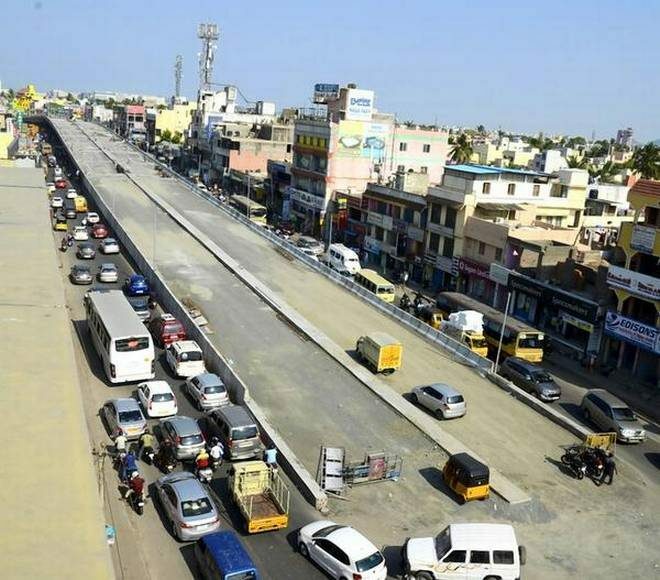 The Porur flyover is likely to be open in 2 weeks with highway department giving finishing touches to the much awaited and delayed project. The rush hour traffic at Porur intersection has been a problem for pedestrians and motorists alike. The delay of the project which was kick-started in 2010 only added to their hassle. The 475 metre long and 17.2 metre wide ambitious flyover project began in 2010 and has been stalled and delayed ever since. The major roadblock happened in 2011 when the department faced difficulties with shifting the metro water pipelines that run beneath the Mount Poonamallee road – Arcot Salai Junction. The highway and metro departments could not find a suitable contractor to take up this crucial task of moving the pipelines which ran the risk of a major disruption in water supply for the city. As a workaround for this issue, the flyover design was changed to let the pipeline remain as it is and the construction restarted in 2015 with a new design and an added cost of Rs.20 crores. After a delay of 7 years and cost overrun, the 54 crore project is finally nearing completion and seems set to be open to the public. Happy if it s true..since i use that road for past 5 years for office going. But dont think so..since seemz lot of work pending.